Amelia Lost is a new on-woman opera by Larry Dellinger which receives its UK premiere on 23 August 2018 as part of the Opera in the City Festival. Amelia Lost is performed by British-American soprano Kathryn Frady with Laurie Brien (piano). 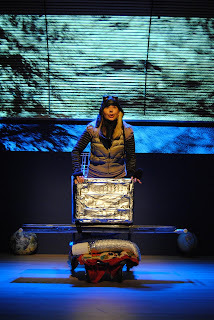 Intriguingly it is the second opera in the last year to deal with Amelia Earhart [see my review of English Touring Opera's production of Russell Hepplewhite's Silver Electra]. In Amelia Lost, a homeless woman believes herself to be aviation pioneer Amelia Earhart. The woman's mind goes back and forth between the homeless woman's reality and her firm belief that she is Amelia Earhart reliving her final flight. Whether she is a homeless woman or actually Amelia Earhart is left for the audience to decide. Further information from the Opera in the City website. I think you mean "one-woman opera" rather than "on-woman".